I’m so excited it’s Spring that I’m already starting my Spring Cleaning! 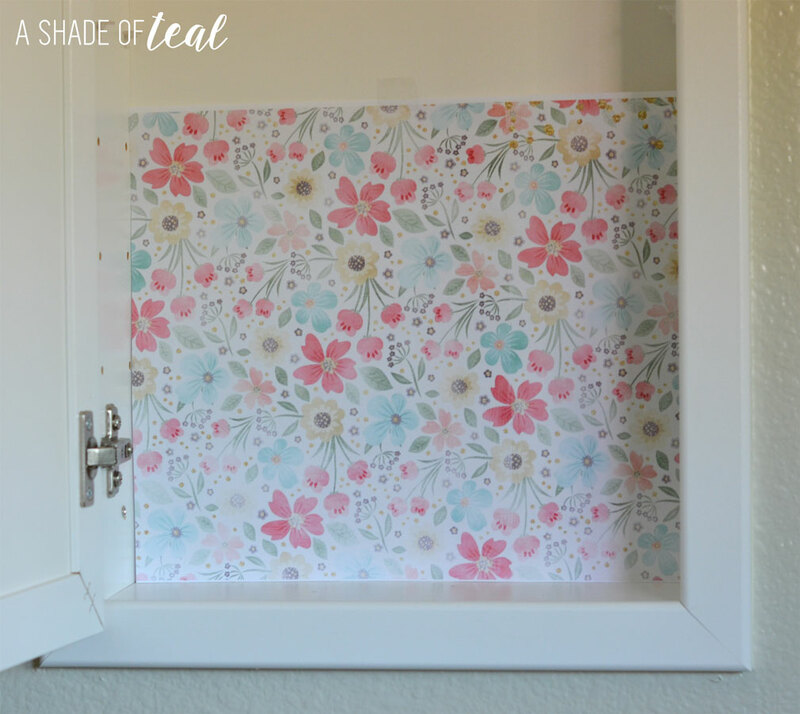 I’ve been wanting to update the medicine cabinet in my daughter’s bathroom with a fun print. I figured it would make it more exciting to put things away and keep them organized. 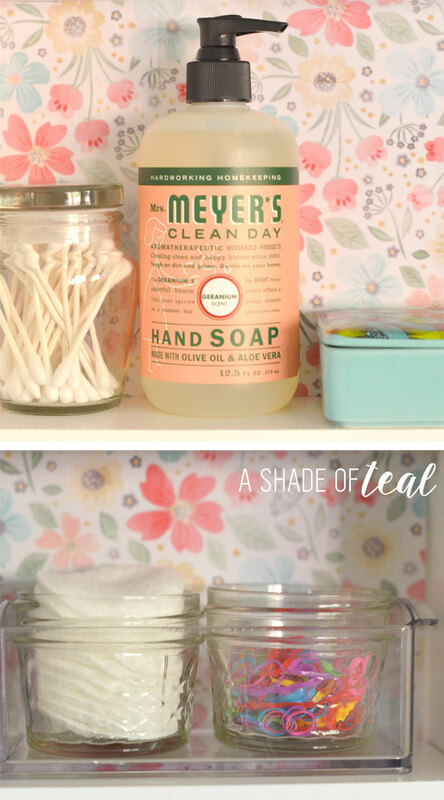 I also recently discovered Mrs. Meyer’s Clean Day® products and I love the bright and colorful packaging. I’m a sucker for pretty packaging! 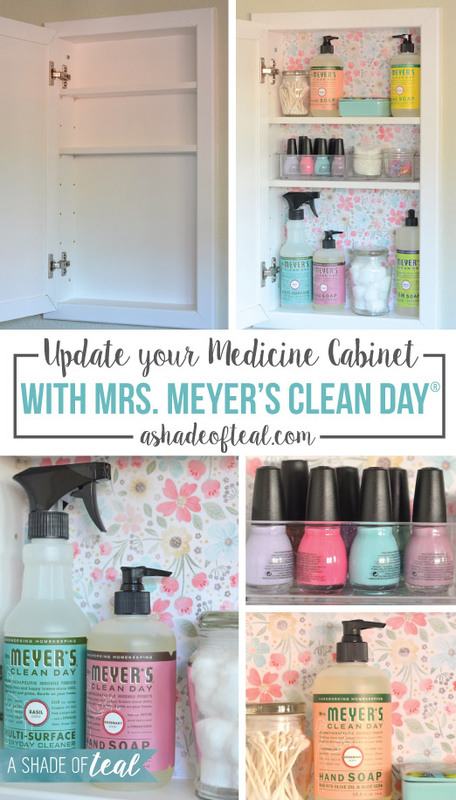 While at my local grocery store; Ralph’s, I saw all the Mrs. Meyer’s Clean Day® products in the home cleaning aisle and was so inspired to finally update the medicine cabinet. 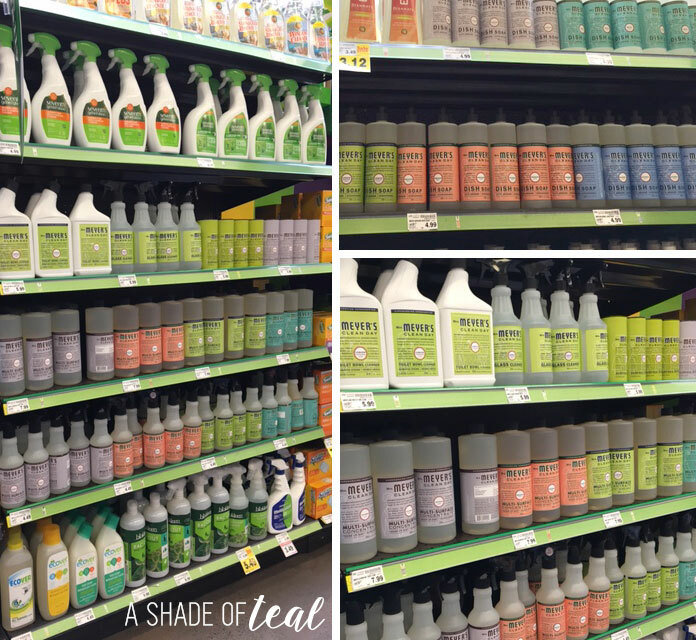 Most of their products will be mixed in with other cleaning products, but you might also find the hand soaps in the beauty aisle. Not only is the packaging beautiful, but the product is great as well. 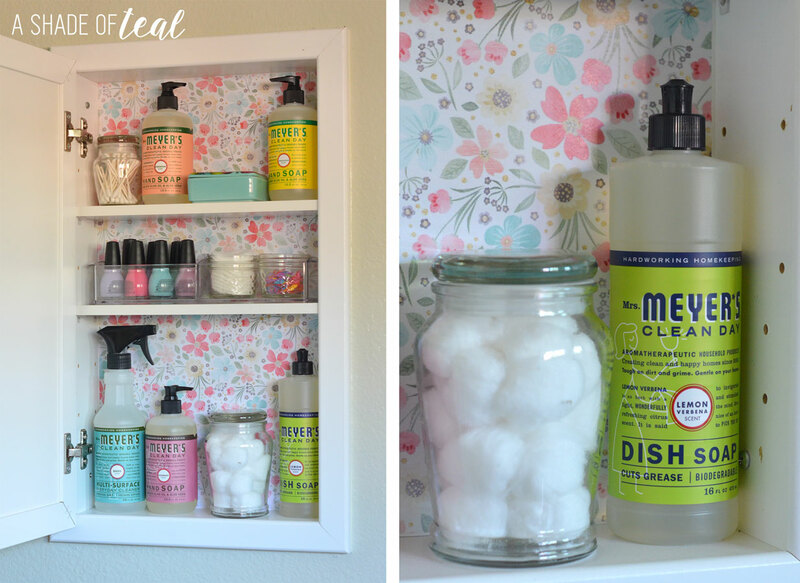 Mrs. Meyer’s Clean Day® household products make cleaning your home fresh, fun, and fragrant. All of the cleaners are made with natural essential oils, are phosphate-free, plus they never test on animals! So, choosing Mrs. Meyer’s Clean Day® is an easy fix when it comes to household products you may need. First thing I did was empty and clean out the medicine cabinet. I used the Mrs. Meyer’s Clean Day® Basil Multi-Surface Everyday Cleaner for this part. Next, I measured the inside of the cabinet to see the dimensions I would need for my floral paper. I then cut the first piece to fit the width of the cabinet like below. I also used double sided tape to hold it in place. This way if I ever want to change out the print I can. 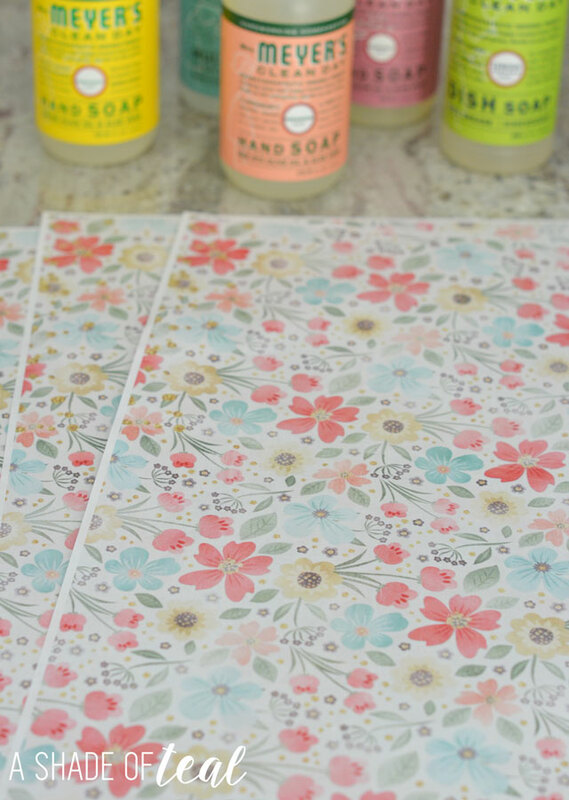 Repeat cutting and taping the rest of the paper in place till you fill the medicine cabinet. Now the fun part! 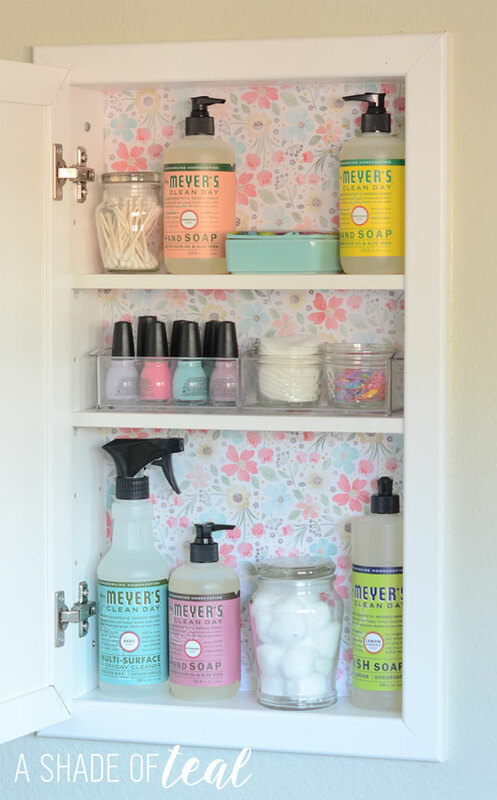 Add back your necessities including your Mrs. Meyer’s Clean Day® products. 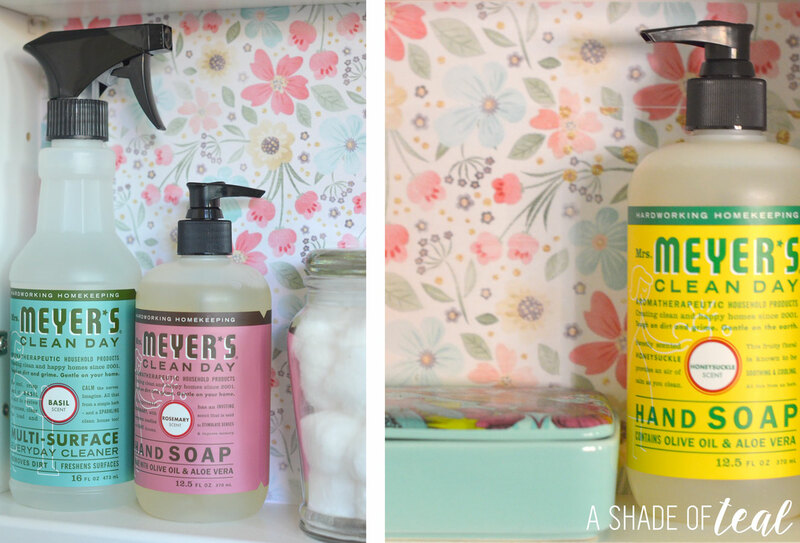 I love how the Mrs. Meyer’s Clean Day® packaging picks up all the colors in my floral print. That’s it! My daughter thought it was the greatest thing once it was complete! 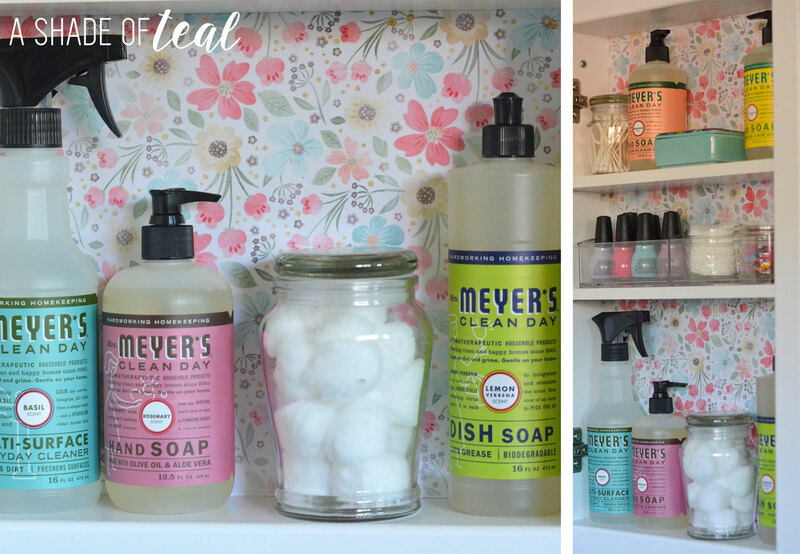 I think Mrs. Meyer’s Clean Day® products make even the ordinary feel enjoyable! 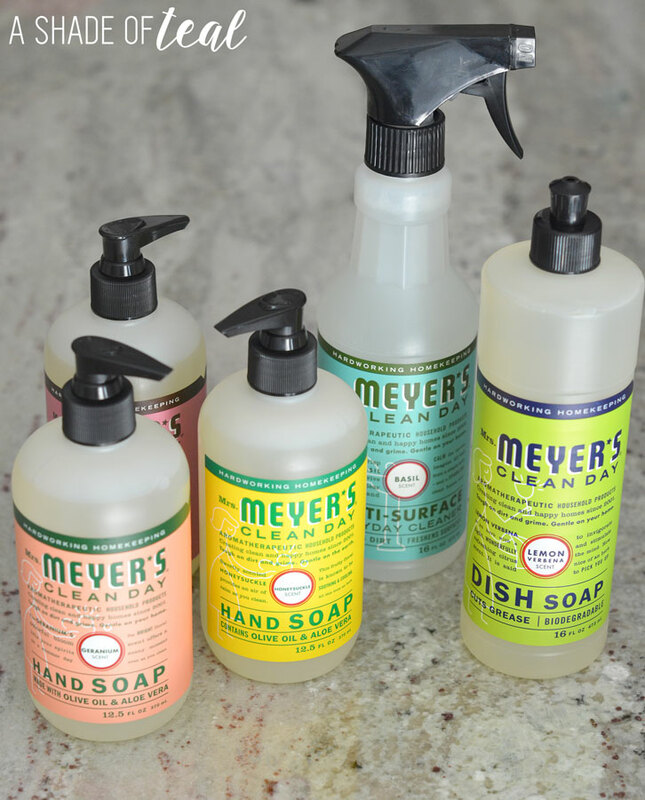 If you want more info on Mrs. Meyer’s Clean Day® products go check out their website or visit their Facebook page HERE. In case you didn’t know, April is Earth month with Earth day being April 22nd. So make sure you are taking extra special care of our home. Have you started Spring Cleaning? Have any organizing or cleaning projects planned? Share away! « Big Girl Room, The Reveal! That sounds like a great brand. Now I want to be sure to check them out. This is the first time that I am hearing about Mrs. Meyers. I don’t think we have that here, but it’s something that I will definitely try if I do see it in supermarket shelves. I must say, I love their packaging! It makes me want to buy them. I am not familiar with Mrs. Meyers cleaning products but I will definitely be on the lookout next time. I love that they use essential oils. Your floral print is beautiful and perfectly brightens a decidedly practical area. I love how organize your cabinet is. Mine needs help. I’m organizing my house one room at a time. I’m glad that you introduced me to these products. I am loving that pattern! The soft colors but busy pattern are the perfect mix! What a great idea!! The floral print is perfect to showcase your Mrs. Meyers products! Can I tell you how cute I think the packaging is? It really looks cool on the shelving. I know, I love their packaging. I love to clean especially when I have nice smelling cleaning products to give me a helping hand. That is so cute and great! I would love to give a try. Thanks for sharing! It is amazing how you keep all so organized! I am not familiar with Mrs. Meyers cleaning products but I will look for them next time! That paper is so pretty. Such a great update & so organized! Very nice job with the medicine cabinet. I’d be interested in trying Mrs. Meyers’s multi-surface cleaner. Wow everything looks so clean and neat, ill give it a try on my moms cabinet, i think is been YEARS since we clean it. This is such a great idea! So cute! Ok, so now I need to give my medicine cabinet a makeover! I haven’t tried this brand of cleaners yet but I love the labels and I have heard lots of good things. Mrs Meyers products are my favorite line of products. The scents are amazing. Love to be apart of the eco-friendly movement. I totally love her lemon scented cleaners. All of these make me want to clean more though, and that’s a good thing! Your medicine cabinet looks great. Just one paper can make difference. Thanks for sharing new brand will check it out. 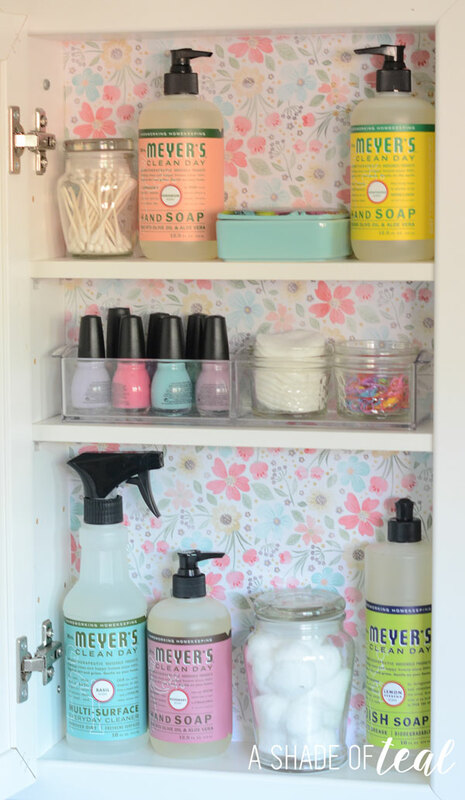 Oh how I love the color of teal and the wall paper made the cabinet even more dainty looking. Plus, I bet Mrs.Meyers products really works wonder to our every day cleansing needs. I looooove this cleaning line! It smells so fresh and is unobtrusive! I am going to give this cleaning line a try as I’ve heard such great things about them. 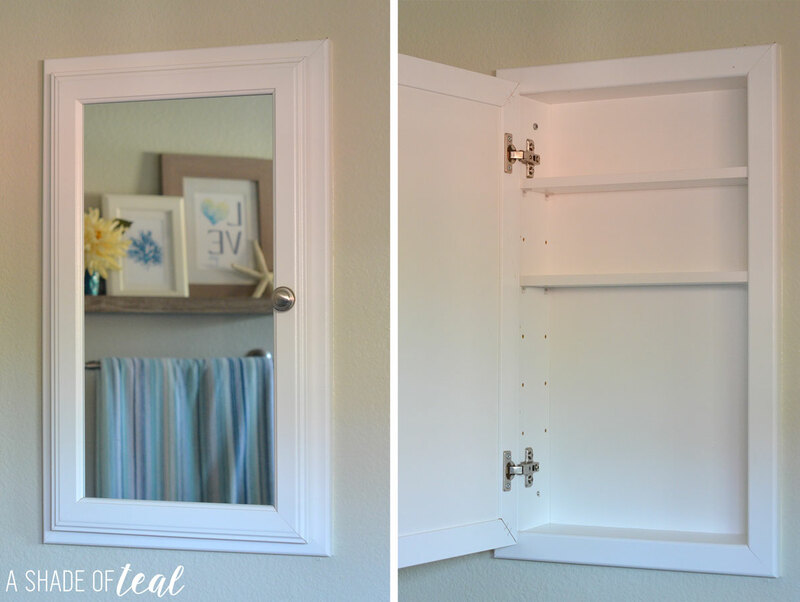 AND…you’re making me wish I had medicine cabinets for your cool DIY! 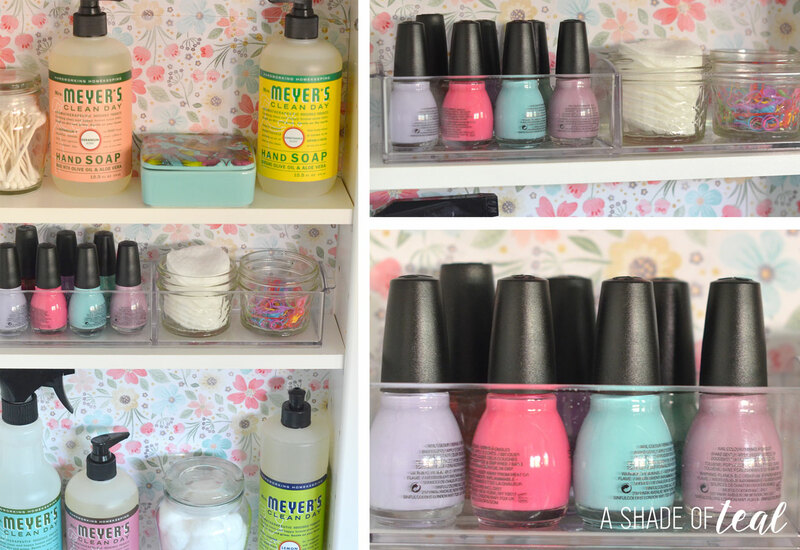 I love the pop of color this gives the medicine cabinet. I will have to give it a try at my house. 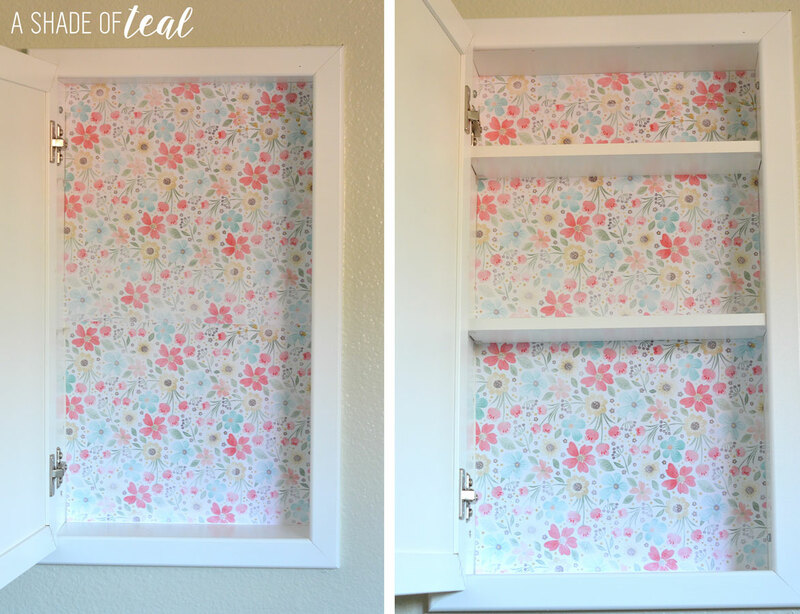 I love how dainty your cabinet looks with just wallpaper being added. It suddenly looks brighter and more feminine. I also don’t endorse products we don’t believe in and I think it helps maintain the integrity of our products.